• The promotion is offered November 23, 2018 – December 31, 2018. • In order to qualify for $10 virtual Bonus Cards, orders must be processed as a single transaction under one order number. • This offer is not applicable to prior purchases. 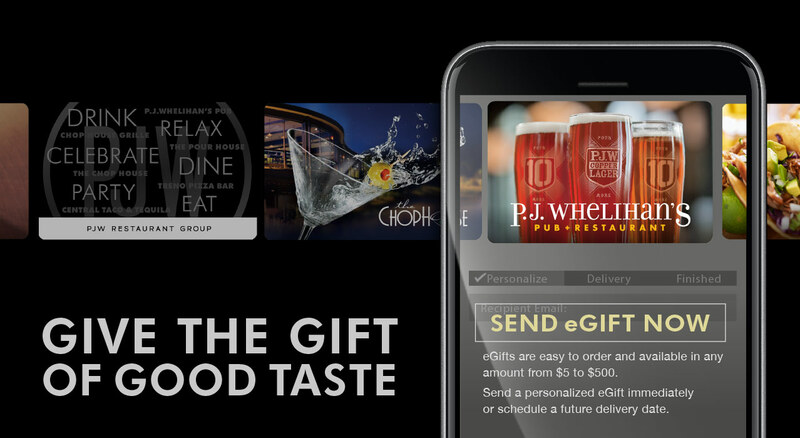 • Physical or Virtual Bonus Cards may be redeemed at PJW Restaurant Group locations except Arena Venues and the Wing Truck. The redemption period is January 2, 2019 – February 28, 2018. • Physical or Virtual Bonus Cards cannot be used for alcohol, tax or gratuity. No cash value. Will not carry a future balance. Lost or stolen cards will not be replaced. Reproductions are not accepted. Redeemable at restaurant locations only. Physical Bonus Cards must be surrendered at time of redemption. • Virtual Bonus Cards may be printed or displayed on a mobile device. Your purchase, use or acceptance of this eGift Card constitutes acceptance of the following terms and conditions. This eGift Card is issued by and represents an obligation solely of P.J.W. Restaurant Holding, LLC. Each time you use it, we'll deduct that amount from the balance until you've used the full balance of the card. (1) Except where required by law, this gift card is not redeemable for cash. (2) We can't replace the value on this card if it's lost or stolen. (3) It may be redeemed at P.J. Whelihan's, The PourHouse, The ChopHouse, Central Taco and Tequila, Treno or any other PJW Restaurant Group-connected restaurant, but is not valid at Arena Venues or Wing Truck. View our Locations. (4) This eGift Card may not be used to purchase alcohol where prohibited by law; (5) eGift Card does not expire; (6) Risk of loss and title to the eGift Card passes to the purchaser upon electronic transmission to the recipient; (7) eGift Card balance may not be transferred to a physical gift card; however, eGift Card may be printed or reprinted for redemption. For eGift Card balance and activity click here. Your purchase, use or acceptance of this Gift Card constitutes acceptance of the following terms and conditions. This Gift Card is issued by and represents an obligation solely of P.J.W. Restaurant Holding, LLC. Each time you use it, we'll deduct that amount from the balance until you've used the full balance of the card. (1) Except where required by law, this gift card is not redeemable for cash. (2) We can't replace it if it's lost or stolen. (3) It may be redeemed at P.J. Whelihan's, The PourHouse, The ChopHouse, Central Taco and Tequila, Treno or any other PJW Restaurant Group-connected restaurant, but is not valid at stadium or arena locations or Wing Truck. Click here for a complete list of locations; (4) This Gift Card may not be used to purchase alcohol where prohibited by law; (5) Gift Card does not expire. For Gift Card balance and activity click here. • The promotion is offered May 28, 2018 – June 17, 2018. • This offer is available ONLINE ONLY. Gift Cards purchased in store will NOT qualify for physical Bonus Cards; virtual eGift Cards purchased online will qualify for virtual Bonus Cards. 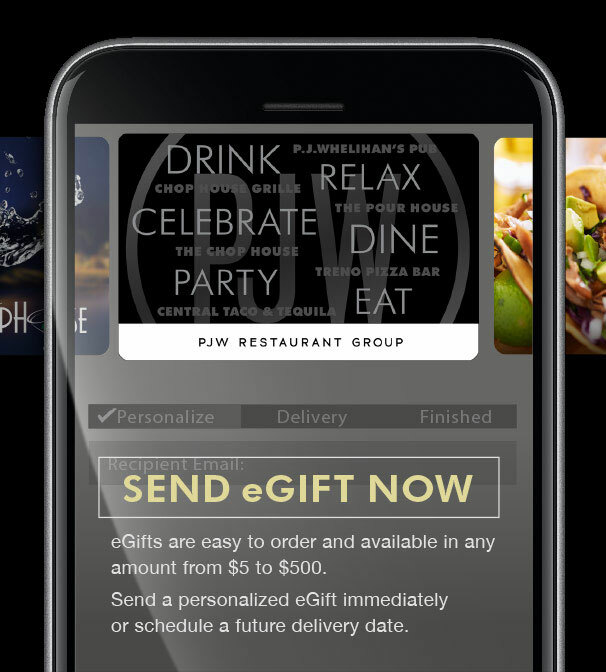 • Virtual Bonus Cards may be redeemed at PJW Restaurant Group locations except Arena Venues and the Wing Truck. The redemption period is June 18, 2018 – September 3, 2018. • Virtual Bonus Cards cannot be used for alcohol, tax or gratuity. No cash value. Will not carry a future balance. Lost or stolen cards will not be replaced. Reproductions are not accepted. Redeemable at restaurant locations only. This site is operated by PJW Restaurant Group (referred to herein as "we," "us," or "our"). “Cookies’ are small data files stored on your own computer. They are generated by web sites such as PJWrg.com to provide users with a personalized and enhanced online experience. By assigning and storing a unique user name cookie on your computer, we are able to offer you personalized collection, filtering, and delivery of information that we feel will be of the greatest interest and value to you, and we are able to save you the trouble of re-entering your personal information each time you wish to request information or promotional materials from us on the web site. Overall, aggregated usage information helps us to improve the services that we provide by showing us how different areas of the web site are being used. If you change your email or postal address, please contact PJW Restaurant Group. In order to make the appropriate corrections, please include both your old and new email or postal address. After receipt of your request and information, we will remove or update your personal data as soon as commercially reasonable. We do not make any representations concerning the content of any sites listed in or linked to the PJWrg.com site. Consequently, we can not be held responsible for the accuracy, relevancy, copyright compliance, legality, or decency of material contained in sites listed in our search results or otherwise linked to PJWrg.com.